A short work week, but a very busy one! Glad to be a part of the hop on this Friday! Thanks for checking out my blog during the hop! I am always looking for tips, hints and helpful stories!! 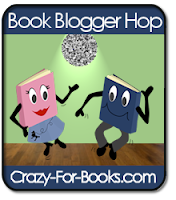 Check out Crazy-For-Books for other bloggers on the hop! Hi, stopping by from the book hop. I'm a new follower and hope to visit often. =D Have a great weekend! Great stuff..i just became a follower. Thanks for stopping at my place. I'm visiting via the blog hop. Happy Friday. Pussreboots. Stopping by to say hello, great blog!